Needles isrenowned for its advanced software solutions designed specifically for legal firms and services. The case management software has become one of the premier solutions that legal firms use to streamline their day to day operations and resources. 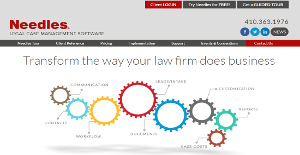 It has successfully catered to about 2000 or more law firms across the geographic boundaries. With a range of features, it allows legal firms to grow over their capacities and multiply their profitability by automating the workflows, payment processes, and documentations. As every law firm may vary according to its size and scale, therefore Needles offers a customized version of the case management with tools such as case type library, insurance adjuster, standardized reports and many analytical tools. The power of Needles lies in the ability to create any field, put any collection of fields on any tab, set up any tasks in any order you see fit for the checklist, and run reports on all of this. At the same time, Needles’ support team is simply unparalleled in the industry. Our U.S.-based support team never works from scripts, and no question or phone call goes unanswered. Pricing is also made affordable, as when you purchase Needles, you are actually buying licenses. Unlike cloud-based systems, you own the software and the licenses FOR LIFE. There are no reoccurring license fees or monthly rental costs. If you continue on our support/maintenance plan, all future upgrades of the case management software are included, and your Needles licenses will never be out of date. Buy the number of licenses you need now and add later as your firm grows. There are no penalties for adding licenses later. Our pricing is upfront, straightforward, and doesn’t come with haggling. With an experience of 25 years in the field, Needles supports the legal firms and community through the most advanced, customizable and innovative case management solutions. The reason for its growing demand is its continuous improvement and upgrading parallel to the advancements in the technology. So no legal firm can lag behind in the competitive legal community, given that they install Needles case management software within their systems. Needles allows the firms to create specific task lists to manage and track the workflow relevant to cases that they work on. For every day, the firm can root out the day’s important tasks, case proceedings, and other checklists that are important to be dealt with on time. This whole workflow process goes through case specific statutes that allow firms to track information regarding the person, document, or a task on time. Moreover, it allows syncs well with the Microsoft Outlook Calendar for managing weekly or monthly engagements. One of the most amazing features of Needles is that it offers customization and personalization on all levels of managing and tracking cases. It’s easy to setup and customize. Whether you need daily report system, personalized checklists or informational tabs, you just click through the software to add such options for your case management. Also, the case type library offers case specific templates which can come handy for a complex set of cases, as it comes with a huge variety of presets. What Problems Will Needles Solve? Scenario #1: Mark is the law firm paralegal, and he has “to do” items to follow up about documents pertinent to three different cases. Unfortunately, he had a family emergency and is out of the office for an extended period of time. Luckily, Mark’s law firm uses Needles, which is driven by the customizable checklist system. The Office Manager uses the mass update feature in Needles to temporarily reassign all Mark’s checklist items to Kelly, a legal assistant who will handle his tasks in his absence. This ensures that no task falls through the cracks regardless of staffing changes. Scenario #2: Jim is the lead attorney at a high volume personal injury law firm that spends a good deal of money on television and online advertising. His firm uses Needles, and when potential clients contact his firm about their cases, the intake specialist records a unique code (which could be tied to phone number called, website clicked, or unique referral code). When his advertising contracts are up for renewal, Jim is able to provide customized and specific reports to his advertising agency in order to refine future marketing efforts and get the most for his advertising dollars. Scenaio #3: The Law Firm of Smith, Jones, and Hannity is a medium sized law firm that handles cases in six different practice areas. Rather than track information on the different cases in multiple systems, the firm uses Needles. Needles provides law firms with a robust online Case Type Library , where firms can download case type templates directly into their system and further customize them to match their individual workflow. The SJH Law Firm has customized their intake sheets, their case/matter types, and their checklists to track information differently for each type of case they handle. Whether it be a worker’s comp case, a complicated divorce, or a slip and fall, their system is designed to handle them all with ease and with the unique fields and tabs that each type of case requires. If you are interested in Needles it may also be sensible to examine other subcategories of Best Law Practice Management Software collected in our database of SaaS software reviews. Every enterprise has its own characteristics, and might need a specific Law Practice Management Software solution that will be adjusted to their business size, type of customers and staff and even specific niche they cater to. It's not wise to count on locating an ideal solution that is going to be suitable for every business regardless of their history is. It may be a good idea to read a few Needles reviews first and even then you should pay attention to what the solution is intended to do for your business and your workers. Do you need a simple and intuitive service with only essential features? Will you really make use of the complex tools required by pros and big enterprises? Are there any specific features that are especially beneficial for the industry you work in? If you ask yourself these questions it is going to be much easier to get a trustworthy solution that will match your budget. How Much Does Needles Cost? Needles is a license based system which allows ownership to the users on annual basis with no recurring or monthly costs. The enterprise pricing options depend on the size of the company and the number of the users. In most cases, the licenses can be purchased for $10,000 a year. We realize that when you make a decision to buy Law Practice Management Software it’s important not only to see how experts evaluate it in their reviews, but also to find out if the real people and companies that buy it are actually satisfied with the product. That’s why we’ve created our behavior-based Customer Satisfaction Algorithm™ that gathers customer reviews, comments and Needles reviews across a wide range of social media sites. The data is then presented in an easy to digest form showing how many people had positive and negative experience with Needles. With that information at hand you should be equipped to make an informed buying decision that you won’t regret. What are Needles pricing details? What integrations are available for Needles? If you need more information about Needles or you simply have a question let us know what you need and we’ll forward your request directly to the vendor.